With Puerto Rico still reeling from Hurricane Maria, the community there faces an urgent need. During the storm, thousands of buildings—historic and new—lost their roofs. Fresh rain furthers damages to these places, delaying people’s return to their homes, businesses, and normal routines. To address this need, the National Trust is working with our partner, Para La Naturaleza (Conservation Trust of Puerto Rico) to provide tarps to 200 homes and other buildings in Puerto Rico. Every donation of $75 will provide a tarp to an affected home or other building to protect it from the elements, slow the structural damage, and help our fellow citizens get back on their feet faster. We sat down with Ivonne Sanabria Pérez, Heritage Coordinator of Para La Naturaleza, to talk more about the Tarps Campaign and how Puerto Rico is building resilience in the wake of tragedy. During the storm, thousands of buildings—historic and new—lost their roofs. As Puerto Rico begins rebuilding, what preservation needs are most important to address? Right now, we are working together with over 50 Puerto Rican communities near our natural protected areas. Part of our funding is going towards helping community centers become oasis of resiliency to serve their residents’ needs. We’re getting them solar panels, water filters. We’ve already been working on that part of the relief effort. For us, handing out food and water is over. We’ve moved onto the second phase, and we’re rebuilding; we want to build resilience within our communities. 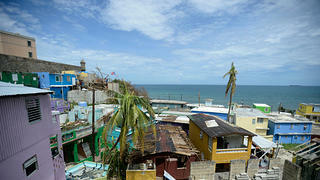 Why are Puerto Rican buildings in need of tarps? How does the Tarps Campaign work? [Hurricane Maria]—which led to over 20 hours of sustained hurricane force winds—caused major damage to roofs in particular throughout the island. 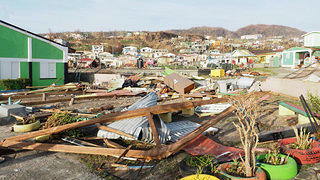 A lot of the roofs that were made of galvanized metal went with the hurricane. For the next two or three weeks, water kept coming into the homes as it continued to rain. We originally thought that Para la Naturaleza could help protect structures in historic areas that had suffered damage by providing them with tarps but, because we weren’t the owners of these homes, we couldn’t ask FEMA for tarps. That part of the relief response has been rather slow, and getting tarps to each historic home depends entirely upon its owner. We were also concerned that each resident whose home had sustained damages felt they were fighting this on their own. Residents who lost their roofs may be staying with a family member or at a shelter, or may not have food. They definitely don’t have electrical power and may not trust the water, so everything is a challenge. We want to provide a sense that help is coming, that people understand there’s someone out there who knows what we’re going through. I think it's really important to have hope that we won’t have to rebuild on our own. The Tarps Campaign will go a long way in symbolizing that help is coming. And all this effort made by people we don’t even know? That’s wonderful. What can we do in the future to support long-term resiliency, especially because of the lessons we’ve learned from the way natural disasters have been handled in the past? One of the most wonderful things in coming to the States has been networking with people who already went through this in Katrina and in Florida. They understand exactly where I’m coming from. I know what FEMA can and can’t do because someone who already lived through that [explained it to me]. That exchange of knowledge should be perpetuated, so it’s accessible for those who will be making decisions during the next disaster. Hurricane damage in Old San Juan. We also need to train people in the trades of rebuilding, and particularly in rebuilding historic structures. [Para La Naturaleza] was already beginning to work on that, but Maria has really sped up the process and prioritized skills we hadn’t thought were priorities before the hurricane. There is a place for other nonprofits and businesses in all of this. The people who are overseeing the preservation of Puerto Rico in an official capacity [employees at Puerto Rico’s State Historic Preservation Office, the Institute of Puerto Rican Culture, and other government organizations] have experienced massive personal loss, as well. One lesson learned is that we can all work to support each other. Our nonprofit has something to contribute to state preservation groups. They don’t have to wait until their employees are able to go out and survey the island’s historic properties, because we have volunteers ready to help out now. We can work together to convey vital preservation information with one voice, and we can decide how we need to tackle the future together. What is the connection between preservation and human life when it comes to a disaster like Hurricane Maria? When it comes to preservation, your home is your home. Preserving these places matters to you because they are more than historic places. I am not as concerned with preserving historic institutional buildings because they will get funding and resources. But many of our historic structures are residences in towns, and that’s all they have. This is their sense of place. It’s where they wake up every morning, it’s where they eat, where they make memories. I can’t fathom the notion that preservation is not important or relevant to daily life, or not something that needs to be tackled immediately. Most people are saying that there are phases to disaster recovery—that we need to get water, food, and shelter first, and that the assessment of damages for historic homes and historic properties can wait. But our organization isn’t tasked with providing shelter, so what can we do? We can go ahead and survey hurricane Maria’s damages to historic properties and provide the information to our state agencies. There are different organizations who can handle different types of needs, and they can all work [on addressing the wider range of Puerto Rico’s needs] at the same time. That way, when our state preservation organizations are ready to move onto the next phase of rebuilding, they’ll have more information than if they had to wait to conduct the damage assessment themselves. Is there a silver lining to all of this? It has to do with the psyche of surviving a catastrophe. We’re connecting to our neighbors and helping each other out, instead of paying attention to our electronic devices. I’ve asked people from New Orleans if this understanding of what really matters —human connections— will last, or if we’ll forget what our communities have recovered when the power returns and we get on with our daily lives. The answer seems to be that we can do both: We can keep the human connections and friendships that we’ve made, and the feeling that our community is cognizant of our neighbors’ needs—but we can also return to social media and modern conveniences without it detracting from the humanity we’ve regained. The way you grow when you survive a catastrophic event really does inform who you become. I’m hoping to look back in 15 years and see that we did the right thing. The past few months have been very difficult, but I wouldn’t change what’s happened. I wouldn’t change what I’ve learned for the world. Mientras Puerto Rico todavía sufre el impacto del huracán María, la comunidad allá tiene una necesidad urgente. Durante la tormenta, miles de edificios históricos y nuevos perdieron sus techos. La insistente lluvia continúa afectando a estos lugares, lo que está retrasando el regreso de la gente a sus casas, comercios y rutinas normales. Para abordar esta necesidad, el National Trust está trabajando con nuestro socio, Para la Naturaleza, para proporcionar toldos a 200 casas y otros edificios. Cada donación de $75 proporcionará un toldo a una casa u otro edificio afectado por la tormenta para protegerlos de los elementos, retardar el daño estructural y ayudar a nuestros vecinos regresar a la normalidad más rápido. Hablamos con Ivonne Sanabria Pérez, coordinadora de asuntos histórico-culturales de Para la Naturaleza, sobre la Campaña de Toldos y cómo Puerto Rico se está fortaleciendo como resultado de la tragedia. Según Puerto Rico empieza a reconstruir, ¿cuáles necesidades en el ámbito de la preservación son las más importantes? Ahora, estamos trabajando con más de 50 comunidades cerca de nuestras áreas naturales protegidas en Puerto Rico. Una parte de nuestros fondos se está destinando a ayudar a que los centros comunitarios se conviertan en oasis de resiliencia para servir las necesidades de los residentes. Les estamos proveyendo energía solar, filtros de agua. Ya hemos estado trabajando en esa parte del esfuerzo de ayuda. Para nosotros, la fase de llevar alimentos y agua ha pasado. Estamos en la segunda fase, y estamos reconstruyendo. Queremos ayudar a fortalecer nuestras comunidades para que crezcan en resiliencia. ¿Por qué necesitan toldos los edificios en Puerto Rico ? ¿Cómo funciona la Campaña de Toldos? [El huracán María], que trajo sobre 20 horas de vientos sostenidos de fuerza de huracán, causó daños mayores a los techos en toda de la isla. Muchos de los techos de cinc se perdieron con el huracán. Y en las semanas subsiguientes continuó lloviendo, por lo que el agua continuó entrando a las casas. Originalmente, pensamos que Para la Naturaleza podría proveer toldos a las estructuras en zonas históricas que sufrieron daños, pero, como no somos dueños de estas casas, no pudimos hacer nada. Esa parte del esfuerzo de ayuda ha sido bastante lenta, y conseguir toldos para cubrir cada casa depende de su dueño. Además nos preocupó que las personas cuyas casas sufrieron daños se sintieran que estaban solos dando la batalla. Los residentes que perdieron sus techos podrían estar quedándose con familiares o en un refugio, o tal vez no tienen acceso a comida. De seguro que no tienen energía eléctrica y tal vez no confíen en la calidad de su agua. Por eso, todo es un reto. Queremos proporcionar un sentimiento de que la ayuda está en camino, y que hay gente allá afuera que conoce lo que estamos pasando. Creo que es muy importante tener la esperanza que proporciona el saber que no estamos solos a la hora de reconstruir. La Campaña de Toldos ayudará mucho en simbolizar que la ayuda está en camino. Y, ¿el que todo este esfuerzo venga de personas que no conocemos? Eso es maravilloso. ¿Qué podemos hacer en el futuro para crear resiliencia a largo plazo, especialmente tomando en consideración las lecciones que hemos aprendido sobre el manejo de pasados desastres naturales? Una de las cosas más maravillosas de haber viajado a los Estados Unidos es el conectar con personas que ya experimentaron los efectos de desastres en Katrina y en Florida. Ellos entienden exactamente lo que estamos viviendo. Ahora sé las cosas que FEMA puede y no puede hacer porque alguien, que ya ha pasado por esta experiencia, [me lo explicó]. Ese intercambio de conocimientos debería perpetuarse para que esté accesible para las personas que estén tomando decisiones durante el próximo desastre. También, necesitamos entrenar más personas en los oficios de la construcción, y particularmente en la reconstrucción de estructuras históricas. [Para la Naturaleza] ya estaba empezando trabajar en esto, pero María ha acelerado el proceso y ha priorizado asuntos que no eran urgentes antes del huracán. Las organizaciones sin fines de lucro y los comercios tienen un rol en esta situación. Hay que recordar que las personas que están supervisando la preservación histórica en Puerto Rico en una capacidad oficial [empleados de la Oficina Estatal de Conservación Histórica, el Instituto de Cultura Puertorriqueña y otras organizaciones gubernamentales] han experimentado grandes pérdidas personales también. Una de las lecciones aprendidas es que podemos trabajar juntos y apoyarnos. Nuestra organización sin fines de lucro tiene algo que contribuir a los esfuerzos de preservación del estado. Ellos no tienen que esperar a que sus empleados puedan recorrer la isla para identificar los daños a estructuras históricas porque nosotros tenemos voluntarios disponibles para ayudar ahora. Podemos trabajar juntos para comunicar con una sola voz la información vital sobre cómo preservar estructuras históricas, y podemos decidir cómo asumir el futuro juntos. ¿Cuál es la conexión entre la preservación y la vida humana en el caso de un desastre como el huracán María? En preservación, tu casa es tu casa. Preservar estos lugares es importante para ti porque son más que lugares históricos. No estoy preocupada con la preservación de los edificios institucionales históricos, porque recibirán fondos y recursos. Pero muchas de nuestras estructuras históricas son residencias que están en los pueblos, y eso es todo lo que tienen. Es lo que les da un sentido de pertenencia. Es donde se despiertan cada mañana, es donde comen y donde desarrollan memorias familiares. No puedo concebir la idea de que la preservación no sea importante o pertinente en la vida diaria, o algo que no se tenga que atender con inmediatez. Se dice que la recuperación de desastres se hace por fases, que primero necesitamos proveer agua, comida y alojamiento, y que la evaluación de daños para las casas y propiedades históricas puede esperar. Pero nuestra organización no está proporcionando alojamiento, entonces, ¿qué podemos hacer? Podemos encargarnos de hacer la inspección de daños en las zonas históricas para proporcionar a las agencias estatales. Las organizaciones que manejan las diferentes necesidades son separadas, y pueden trabajar paralelamente [para atender el abanico de necesidades de Puerto Rico]. De esa manera, cuando nuestras agencias de preservación estatales estén en posición para abordar la próxima fase de la reconstrucción, tendrán más información que si hubieran tenido que esperar a hacer ellos mismos la evaluación de daños. ¿Hay un resquicio de esperanza de esta situación? Tiene que ver con la psiquis de sobrevivir una catástrofe. Estamos conectando con nuestros vecinos y nos estamos ayudando unos a otros, en vez de estar pegados a los dispositivos electrónicos. Le he preguntado a las personas de New Orleans si este conocimiento de lo que es realmente importante —las conexiones humanas— durará, o si olvidaremos lo que nuestra comunidad ha recuperado una vez regrese la energía eléctrica y podamos continuar con nuestras vidas. La respuesta parece ser que podemos hacer las dos cosas: podemos mantener las conexiones humanas y las amistades que hemos hecho, y el sentimiento de que nuestra comunidad es consciente de las necesidades de nuestros vecinos. Pero también, podemos regresar a las redes sociales y las conveniencias modernas sin perder la humanidad que hemos ganado. La manera en que uno crece cuando se sobrevive un evento catastrófico informa lo que seremos en el futuro. En 15 años espero poder mirar atrás y ver que hicimos lo correcto. Los últimos meses han sido muy difíciles, pero no cambiaría lo que ha pasado. No cambiaría lo que he aprendido por nada del mundo.